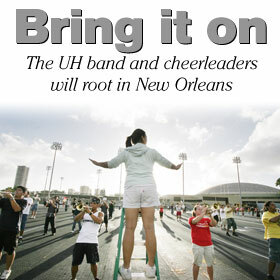 The University of Hawaii Rainbow Marching Band practiced Friday at Cooke Field for the upcoming Sugar Bowl trip. Janice Kunishige conducted the musicians as they rehearsed. Russell Okata, a kingmaker in Hawaii politics for 26 years, will retire Dec. 31.